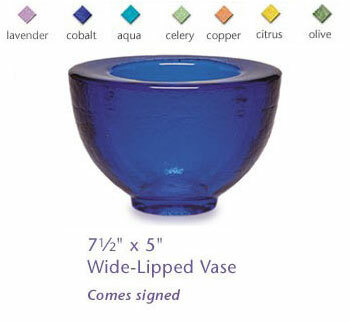 Fire & Light Glassware Wide Lipped Vase...luminous, breathtaking glass art. The Wide Lipped Vase, created for both form & functionality, by Fire & Light, known for its vibrant color & texture...there is nothing else like it! Fire & Light hand poured glassware is made from post consumer recycled glass, a once wasted resource & is at the forefront of sustainable living. Fire & Light Wide Lipped Vase.